City A.M. 3 March 2019. Quoted in an article by Michael O'Dwyer on the future of news. Marketing & Media Online. 20 February 2019. Article by Gábor Baross about my report on Time Spent Reading Newsbrands. Munich radio M94.5. 21 January 2019. Interview with Lea Dakowski about automated journalism. Sunday Independent. 16 December 2018. Article by Steve Dempsey mentioning my research into a newspaper's switch to online-only. The Journalist. October 2018. Article by Ray Snoddy on my research into a newspaper's switch to online-only. Baekdal Plus. October 2018. Article by Thomas Baekdal on my research into a newspaper's switch to online-only. Süddeutsche Zeitung. 1 October 2018. Article on my research into a newspaper's switch to online-only. Hospodářské Noviny. 1 October 2018. Article by Filip Rožánek about my research into a newspaper's switch to online-only. Laboratorio de Periodismo, 27 September 2018. Article about my research into a newspaper's switch to online-only. Meedia, 27 September 2018. Article about my research into a newspaper's switch to online-only. Nieman Lab, 26 September 2018. Article by Joshua Benton about my research into a newspaper's switch to online-only. La Nación, 18 August 2018. Article by Lorena Oliva mentioning my research into print and online news consumption. Deutscher Drucker, 28 June 2018. Article by Manfred Werfel on my research into time spent reading newsbrands. Sunday Independent, 22 April 2018. Article by Steve Dempsey quoting me on the launch of the UK's new audience currency for published media, PAMCo. Khaleej Times (Dubai), 1 March 2018. Article by Kelly Clarke on my research into print and online news consumption. Der Standard, 23 February 2018. Article by Marlis Prinzing mentioning my research into automated journalism. The Drum, 1 February 2018. Article by Andy Dangerfield mentioning my research into the age demographics of newspaper consumption. La Razón, 15 December 2017. Article by Celia Maza on my research into the age demographics of newspaper consumption. Press Gazette, 8 December 2017. Article by Freddy Mayhew on my research into the age demographics of newspaper consumption. Business Standard (India), 8 December 2017. Article on my research into the age demographics of newspaper consumption. Helagotland.se, 8 December 2017. Article by Eva Bofride mentioning my research into the age demographics of newspaper consumption. Journalisten, 7 December 2017. Article by Johannes Nesser on my research into the age demographics of newspaper consumption. Journalism.co.uk, 7 December 2017. Article by Caroline Scott on my research into the age demographics of newspaper consumption. China Daily, 3 November 2017. Article by Angus McNeice mentioning my research into the diversity of the journalism workforce. Süddeutsche Zeitung, 11 October 2017. Article by Sebastian Jannasch on a talk I gave about automated journalism. Medievärlden [Media World, Sweden], 11 October 2017. Article by Gunnar Springfeldt on a talk I gave about automated journalism. Journalism.co.uk, 28 September 2017. Article by Catalina Albeanu quoting my survey of journalists in the UK. European Journalism Observatory, 12 September 2017. Article by Caroline Lees and Hannah Anson quoting my survey of journalists in the UK. Business Insider, 7 July 2017. Article by Sam Shead quoting my reaction to a news automation project. The Times, 7 July 2017. Article by Nadeem Badshah mentioning my research into automated journalism. Evening Standard, 7 July 2017. Article by Jonathan Mitchell mentioning my research into automated journalism. Infonet, 7 July 2017. Article by Pham Khanh mentioning my research into automated journalism. Globalnews.ca, 6 July 2017. Article by Rahul Kalvapallé mentioning my research into automated journalism. BBC News, 6 July 2017. Interview with me in article about local automated journalism. Paperjam, 28 June 2017. Article by Mike Koedinger mentioning my research into newspaper consumption in the mobile age. Huffington Post, 20 June 2017. Article by Steven Barnett mentioning my research into newspaper consumption in the mobile age. Monocle 24 radio, 17 June 2017. Interviewed about my research into newspaper consumption in the mobile age. The Economist, 4 May 2017. Quoted in an article about Axel Springer's digital transformation. Mediatel Newsline, 26 April 2017. Article by Raymond Snoddy mentioning my research into newspaper consumption in the mobile age. Journalisten, 27 March 2017. Article by Johannes Nesser on my research into newspaper consumption in the mobile age. France Inter, 16 March 2017. Article and radio story by Catherine Boullay on my research into automated journalism. Vice, 14 March 2017. Article by Brendan Scott mentioning my research into automated journalism. Franceinfo, 13 March 2017. Article and radio story by Jérôme Colombain on my research into automated journalism. SWR2, 13 March 2017. Discussion by Martin Gramlich and Jessica Kunert of my research into automated journalism. The Conversation, 7 March 2017. Article by me on my research into automated journalism. 360com, 7 March 2017. Article by Anna Maria Ciardullo on my research into automated journalism. Key4biz, 7 March 2017. Article by Luigi Garafalo on my research into automated journalism. The Register, 6 March 2017. Article by Katyanna Quach on my research into automated journalism. Mediacentar Online, 6 March 2017. Article on my research into automated journalism. The Baron, 5 March 2017. Article on my research into automated journalism. Influencia, 5 March 2017. Article by Florence Berthier on my research into automated journalism. Werbewoche, 3 March 2017. Article on my research into automated journalism. Journalism.co.uk, 2 March 2017. Article by Caroline Scott on my research into automated journalism. New Statesman, 2 March 2017. Article by Amelia Tait on my research into automated journalism. The Australian, 1 March 2017. Article by Darren Davidson on my research into newspaper consumption in the mobile age. Forschung & Lehre magazine, March 2017, p.240. Article by Vera Müller on my research into newspaper consumption in the mobile age. Diario de Ibiza, 18 February 2017. Article by Tino Pertierra on my research into newspaper consumption in the mobile age. Diari de Girona, 17 February 2017. Article by Tino Pertierra on my research into newspaper consumption in the mobile age. The Drum, 17 February 2017. Article by Tony Walford on my research into newspaper consumption in the mobile age. Port Douglas & Mossman Gazette (Australia), 16 February 2017. Article on my research into newspaper reading in the mobile age. Financial Times, 16 February 2017. Article by Shannon Bond and David Bond mentioning my research into newspaper consumption in the mobile age. The Australian, 13 February 2017. Article by Chris Mitchell on my research into newspaper consumption in the mobile age. Resonance FM, 8 February 2017. Interviewed by Peter Warren for a radio documentary on artificial intelligence and the media. The Australian, 6 February 2017. Article by Jack Shafer on my research into newspaper consumption in the mobile age. Sunday Independent, 5 February 2017. Article by Steve Dempsey on my research into newspaper consumption in the mobile age. The Memo, 3 February 2017. Article by Oliver Smith on my research into newspaper consumption in the mobile age. NiemanLab, 3 February 2017. Article by Laura Hazard Owen on my research into newspaper consumption in the mobile age. Campaign magazine, 1 February 2017. Article by Emily Tan on my research into newspaper consumption in the mobile age. Politico, 2 February 2017. Article by Jack Shafer on my research into newspaper consumption in the mobile age. Journalism.co.uk, 2 February 2017. Article by Caroline Scott on my research into newspaper consumption in the mobile age. 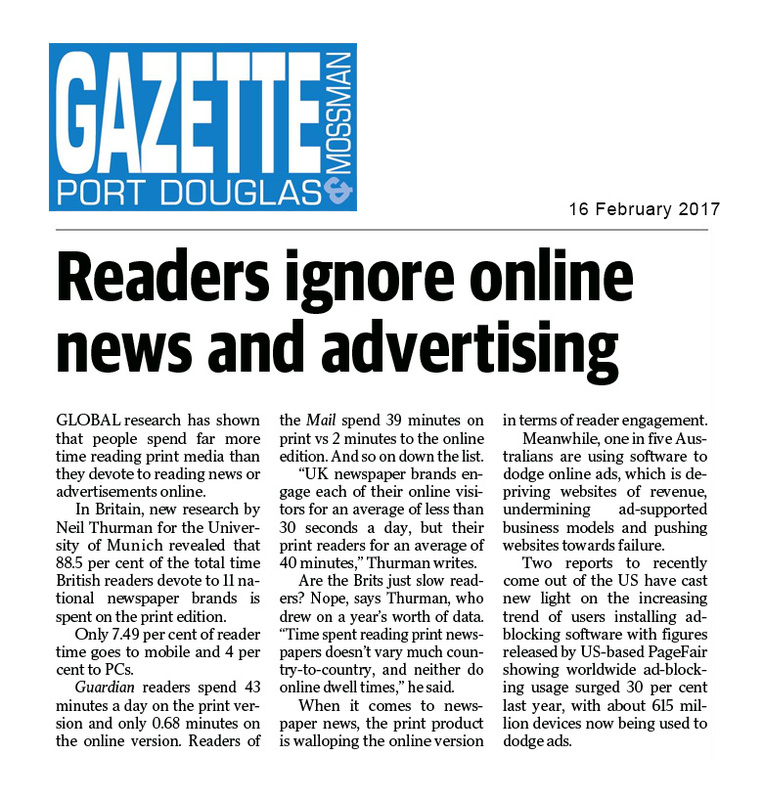 Press Gazette, 1 February 2017. Article by Dominic Ponsford on my research into newspaper consumption in the mobile age. PR Week magazine, 31 January 2017. Article by Robert Smith on my research into newspaper consumption in the mobile age. The Guardian, 31 January 2017. Article by Roy Greenslade on my research into newspaper consumption in the mobile age. Telegraph.co.uk, 29 December 2016. Article by Chris Moss mentioning the results contained in my book Journalists in the UK. Heise Online, 7 December 2016. Article by Stefan Krempl mentioning my research into automated journalism. First Draft News, 11 May 2016. Article by Alastair Reid on my book Journalists in the UK. The Conversation (UK edition), 10 May 2016. Self-penned article based on my book Journalists in the UK. Hold the Front Page, 10 May 2016. Article by David Sharman on my book Journalists in the UK. The Guardian, 9 May 2016. Article by Roy Greenslade on my book Journalists in the UK. The Press Gazette, 9 May 2016. Article by Freddy Mayhew on my book Journalists in the UK. Journalism.co.uk, 9 May 2016. Article by Caroline Scott on my book Journalists in the UK. Journalism.co.uk, 9 May 2016. Interview in podcast with Caroline Scott on my book Journalists in the UK. BBC Academy, 9 May 2016. Self-penned article based on my book Journalists in the UK. Guardian.com, 24 March 2016. Article by Oscar Williams on my research into diversity in UK journalism. Press Gazette, 24 March 2016. Article by Dominic Ponsford on my research into diversity in UK journalism. Journalism.co.uk, 24 March 2016. Article by Caroline Scott on my research into diversity in UK journalism. Hobart Mercury, 17 December 2013, Article by Christopher Bantick on my research on newspaper reading in the digital age. Journalism.co.uk, 23 October 2013. Interview with me—based on my research—by Rachel Bartlett for a feature on news personalisation. Journalism.co.uk, 4 October 2013. Self-penned ‘Expert Commentary’ based on my research on newspaper reading in the digital age. The Conversation (UK edition), 3 October 2013. Self-penned ‘Analysis’ article based on my research on newspaper reading in the digital age. Journalism.co.uk, 30 August 2013. Discussion of my research on news personalisation in Journalism.co.uk’s weekly podcast. Monocle, 10 August 2013. Interview with me by Tyler Brûlé on Monocle’s ‘The Stack’ radio show on my research on newspaper reading in the digital age. The Media Briefing, 9 August 2013. Article by Jasper Jackson on my research on newspaper reading in the digital age. The Times, 8 August 2013. Article by Ben Webster on my research on newspaper reading in the digital age. The Australian, 8 August 2013. Article by Ben Webster on my research on newspaper reading in the digital age. Financial Times, 8 August 2013. Mention of my research on newspaper reading in the digital age in article by Emily Cadman. Journalism.co.uk, 8 August 2013. Article by Alastair Reid on my research on newspaper reading in the digital age. Press Gazette, 7 August 2013. Article by Gavriel Hollander on my research on newspaper reading in the digital age. BBC World Service, 2–7 July 2013. Interview with me for the documentary series Media Futures, episode: ‘Media Futures—Internet Age’. Guardian.co.uk, 24 June 2013. Article by Roy Greenslade reporting my chapter in Reuters Institute Digital News Report 2013. Press Gazette, 20 June 2013. Self-penned article based on my chapter in Reuters Institute Digital News Report 2013. Tech Press Critique, 4 December 2012. Interview with me by Abraham Hyatt on my research on live blogging. Journalism.co.uk, 22 November 2012. Self-penned article based on my research on live blogging. Guardian.co.uk, 20 November 2012. Article by Roy Greenslade reporting my research on live blogging. The Atlantic, 3 April 2012. Article by Rebecca J. Rosen on my research into personalized news. Communications of the ACM, 2011. Article by Marina Krakovsky on my research into personalised news. HoldtheFrontPage.co.uk, 14 September 2011. Article by Sarah Bould reporting my research on hyperlocal news. Guardian.co.uk, 12 May 2011. Article by Roy Greenslade reporting my research on personalised news. Guardian.co.uk, 9 September 2010. Invited Q&A with me on digital book publishing. CBC (Canadian national radio), April 2009. Interview on my research into online-only newspapers. Columbia Journalism Review, 16 April 2009. Article by Megan Garber on my research on online-only newspapers. China Daily, 21 April 2009. Article reporting my research on online-only newspapers. Le Figaro, 20 April 2009, p. 30. Article by Marie-Laetitia Bonavita reporting my research on online-only newspapers. The Independent, 20 April 2009, p. 42. Article by Donald Trelford on my research into online-only newspapers. Guardian.co.uk, 16 April 2009. Article by Bobbie Johnson reporting my research on online-only newspapers. De Volkskrant, 16 April 2009. Article by Wilco Dekker reporting my research on online-only newspapers. Wall Street Journal, 15 April 2009. Article by Andrew LaVallee on my research into online-only newspapers. Press Gazette, 7 April 2008. Self-penned op-ed piece based on my research into newspapers’ multimedia strategies. Telegraph.co.uk, 28 February 2008. Article by Shane Richmond on my research into the adoption of user-generated content by mainstream news websites. Marketing, 5 December 2007, p. 40. Mention of my research into online newspapers’ business models. The Times, 3 August 2007, p. 43. Article by Rhys Blakely on my research into US audiences for British news. Guardian.co.uk, 3 August 2007. Article by Roy Greenslade on my research into US audiences for British news. Telegraph.co.uk, 2 August 2007. Article by Marcus Warren on my research into US audiences for British news. Telegraph.co.uk, 27 July 2007. Article by Marcus Warren mentioning my research into US audiences for British news. Guardian.co.uk, 5 July 2007. Article by Roy Greenslade on my research into the business of online news. South China Morning Post, 7 March 2006, p. 1. Interview with me by Stuart Biggs in an article on citizen journalism.